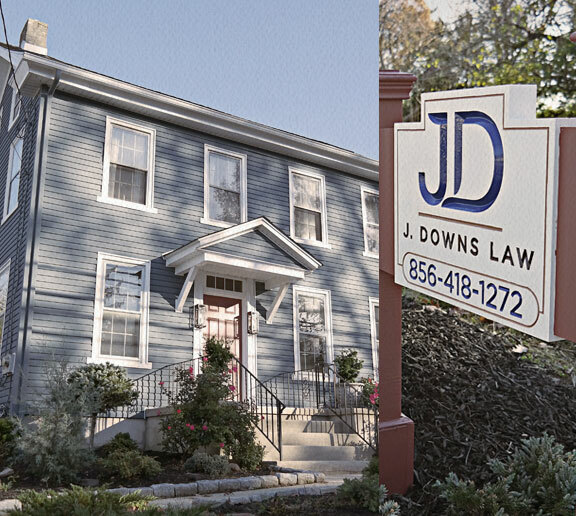 J. Downs Law is a civil litigation law firm representing individuals and businesses in New Jersey, New York, and Pennsylvania across a wide range of practice areas. The firm was built on the unwavering work ethic by founder and President, Jeffrey S. Downs. Working full time while in college and through law school, Jeff has always been hard at work to achieve his goals. Jeff listens to his clients, their needs, and desired outcomes and develops a focused litigation plan to maximize the best possible result for his clients. Litigation is stressful for clients facing real-world issues and Jeff understands that the last thing a client needs is the additional stress stemming from a non-responsive or ill-prepared attorney. Jeff and his team have the experience and flexibility to adapt and to respond to the needs of the client during each phase of litigation and seek to minimize their stress. While it is preferred that client meetings occur at the main office of J. Downs Law, in Mullica Hill, New Jersey, Jeff upon arrangement has the ability to meet in Philadelphia and Princeton, New Jersey. In many cases, Jeff meets his business clients at the location of the business. Jeff will also arrange to meet disabled or elderly clients at their residence. J. Downs law maintains relationships with other top rated Attorneys and Professionals outside the practice of law to assist clients in their lifetime law needs. Jeffrey S. Downs is an alumni of some of the top national law firms and has represented individuals, businesses, and Fortune 500 companies across a variety of practice areas, including employment disputes, personal injury, sexual harassment, defamation, discrimination, commercial litigation, contract litigation, property and real estate disputes, and fraud. Jeff is a proven leader and continues to mentor many starting and mid-career attorneys so that the primary goal of legal representation may be accomplished: Client Satisfaction. J. Downs Law founder and President is experienced, knowledgeable, professional and flexible which allows for focused representation culminating in achieving the best possible results and satisfaction of each client. Jeff uses his vast experience as both a plaintiff attorney and civil defense attorney to bring a unique perspective to developing a litigation plan that has proven successful when dealing with the sophisticated legal issues relating to his individual and business clients. Jeff served as a federal law clerk to the Honorable Cynthia M. Rufe of the Eastern District of Pennsylvania and brings first-hand knowledge of the procedural prerequisites needed to file cases and execute a successful litigation strategy. In addition to his practical experience at the trial level, Jeff has successfully drafted briefs and argued before numerous appellate courts, including the Pennsylvania Superior Court, the United States Court of Appeals for the Third Circuit and, the New Jersey Supreme Court. In 1994, Jeff earned his Bachelor of Science in Business and Marketing with Honors from Rutgers University School of Business and was named to the National Dean’s List of America. He earned his Juris Doctorate with Honors from Rutgers University School of Law in 2001 and was named a Dean’s Scholar for his academic achievements. While in law school, Jeff was elected to serve as a faculty aid in legal writing and was elected Business Editor of the Executive Board of the Rutgers Law Review where his writing on Amusement Ride Safety was published in Volume 32 of the Fall 2000 Edition of the Journal. Jeff was awarded the coveted Top Ten Brief Award designation and was a finalist in the Hunter Moot Court Competition. Jeff has published numerous articles and blogs relating to the law and has been called upon for his experience to draft continuing legal education materials across a variety of practice areas. Jeff was named a Rising Star in Philadelphia Magazine’s Annual List of Super Lawyers and Rising Stars and has received the Top Ten Client Satisfaction Award. Jeff is active in his local community, sharing his interests in historic preservation and donating his time to a golden retriever rescue where he rescued “Trooper”, who had been tied to a tree and endured the willful neglect of his owner for several years. You may find Jeff at a rock concert, a truck and tractor pull, an amusement park (searching for the next tallest and fastest coaster), or enjoying the Academy of Music or the Philadelphia Academy of Ballet. At home, Jeff’s private property, also located in Mullica Hill, has been toured for both its historic value, unique gardens, and landscape elements. Jeff enjoys landscaping and has been consulted with and/or hired to design landscapes for individuals and businesses – when he is not in the courtroom. If you find him building a rock wall or hauling a tree in or around Mullica Hill and Harrison Township, be sure that he is tapping into his creativity, giving him time to thoughtfully reflect for the purpose of advancing the interests of his clients. The mission of J. Downs Law is simply stated in two words: client confidence. J. Downs Law achieves client confidence in both the legal representation delivered and in the value and efficiency of the service provided. The experienced legal team offers the representation of large firm, plaintiff- and civil defense experience and combines it with small town values. Jeff prides himself on properly explaining the legal process to his clients and using best practices at every step of the litigation. Jeff strives to exceed the expectations of his clients and looks forward to assisting each one.